spotted a silver 32 with dark rims near the police academy at largs. saw the sau sticker at the last moment, couldn't get a wave off. nice car dude. i was in the dirty maroon 33.
you don't need to be specific, but what area of north haven, in the marina area or the older area's that were built in the 70's. i live near the foodland so i think i'll be keeping a close eye on mine. arm up people, we need to fix this problem ourselves, cops are useless. yeah, liked the demo and yes, does look mint on a hd lcd. will pick up the game this week when it comes out. i got the same problem. i had to take my shocks out when going over the pits and found my shocks are rooted. can be compressed by hand. this was about 2 months after pedders said they were in perfect working order. go somewhere good. a lot of bogans work at pedders. i got randomly pulled over the other night because the po-po 'thought the car was stolen'. i asked them about it a bit more and apparently about a dozen have been stolen in the last couple of months. alarm up people, you could be next! Are Blue Parker Globes Legal? i think the LED t10 are still illegal, they are in sa anyway. went over the pits today and got re-defected for them. i thought the reason speed cameras were set up for 10% lea-way was because the ADR's state a vehicle manufacturer needs to make sure the speedo is accurate by +/- 10%. they can't book you if the law states your speedo is allowed to show 60 when in actual fact your doing 66. the ADR's set you up to get fined. theoretically i should be able to drive 121kph in a 110 zone because my speedo is allowed to be out 10%. i could be wrong though. Pauly33GTS-t, that would be awesome man. i'll pm you. cheers madaz for the reply, not sure on the 4 door ones fitting though. ......and yes ukai, the 14th is tuesday, i should of wrote the 17th. thanks everyone who's helping out, i'll speak to you on the weekend. the last thing on my checklist to clear my defect is ride height. 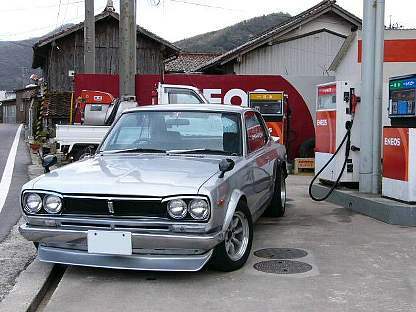 anyone got any standard springs for a skyline i could borrow for a few days? i'd really appreciate it. that would be awesome man. i'll pm you. anyone have some standard springs lying around that i could borrow for a couple of days? i'll look after ya. as the title states, got defected last night for atmo blow off valve. need to return the car to normal. i've got most of the stuff i need( ecu, blow off valve, standard rims with 3 tyres etc..) but need a little help in sourcing: 1. standard springs 2. 1 standard rim with tyre as one of mine has been slashed from previous owner. would probably be better with 2 so they match tread. regency can be picky sometimes. 3. maybe cat back exhaust. i'll try with mine but doubt it will get through. if anyone could help me out i'd been keen on buying you a carton/bottle or money. the car is booked in at regency fri 14th august at 9:40am. it would only be for a couple of days, mainly to get the parts changed over and back again. i'm a very trustworthy person looking for a little help from the skyline community. if you can help me out or know anyone who could, pm me or ring me on 0403462864. cheers, craig p.s. the car is a series 1 r33. cheers guys. will have a crack this week.